LURAY, VA., June, 2014 – Though the current West Main Street Bridge in the Town of Luray was constructed by the Virginia Department of Transportation in 1934, the history of the bridge dates back well into the 1800s. As the bridge undergoes a new design to begin in 2016, the Town of Luray reflects on the bridge’s fascinating history. Combing through local records and historical archives, Dan Vaughn worked to compile historical data and photographs from a number of sources, including the YESTERYEARS series of archived news from the Page News and Courier. Advance steps to the front this time in the interest of pedestrians of Luray. We have a bridge which is of more importance to our people than the famous bridge uniting New York and Brooklyn. It furnishes a way for hacks, wagons and footmen over the beautiful Hawksbill stream. It is a part of Main Street, about the center of town. Will not our council add to the comfort and safety of them who do not always ride, by extending the sidewalk on the right of the street going east in a straight line across the stream? This would make it a part of the bridge proper, and the wall of the bridge now would serve as a partition between the walkers and the riders. As developments of the bridge continued from 1884, citizens remained interested in the bridge and its safety. Our town is improving and probably we may have a new bridge over the Hawksbill when the present one tumbles down. Five years later, in 1893, concerns grew over how much weight the bridge could carry. Notwithstanding the general fear entertained since the fresh of the bridge across the Hawksbill in this place, 34 cattle, weighing 37,000 pounds or 18 ½ tons, oblivious of the opinion of other people, made a safe passage across it last Saturday. Since that time we notice people putting their feet down square on it. In 1901, the bridge had progressed to begin construction on a metal bridge. According to an article published in the May 2, 1901 edition of the Page News & Courier, the bridge was to be rebuilt in iron, under construction of the American Bridge Co. One year later, as construction continued, challenging weather threatened delays in the completion of the iron bridge. On November 27, 1902, a representative from the American Bridge Co. provided an assurance that the bridge would be completed in two weeks’ time. It was suggested in the Nov. 29, 1902 edition of the Page News & Courier, that the finalization of the bridge could be noted as a Christmas gift. The actual completion of the iron bridge, however, was finalized on December 31, 1902. In 1934, the bridge was re-constructed into the concrete design that has remained until today. The Page News & Courier reported on May 26, 1939 that improvements to the bridge were made to include the concrete material and the addition of lights. Today, the West Main Street Bridge in Luray sees more than 6,600 vehicular trips per day (VDOT-2012) and more than one hundred pedestrian trips each day. The new, proposed new design of the bridge has been geared to match the current look and size with two span steel beans and a reinforced concrete deck poured in place. The bridge will include a single in-stream pier and new abutment seats behind the existing abutments. Two sidewalks and a similar railing with integrated electric conduits will also make up part of the new design. The Greenway trail and walking bridge will also be replaced and upgraded. Construction on the new bridge is set to begin in early 2016. A detailed look at the planning, design and timeline can be found online. 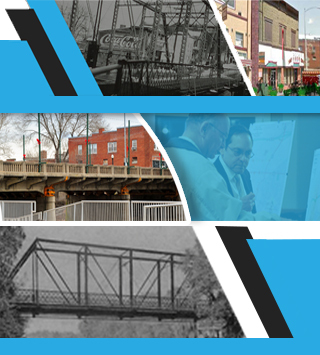 In continued recognition of the bridge’s past, the website also features photographs of the bridge throughout history. For additional media information, including press-ready photographs, graphics, logos and factual data, please continue to visit this website or email us.